M2 Machines Detroit Muscle Release 41. No Envelopes. 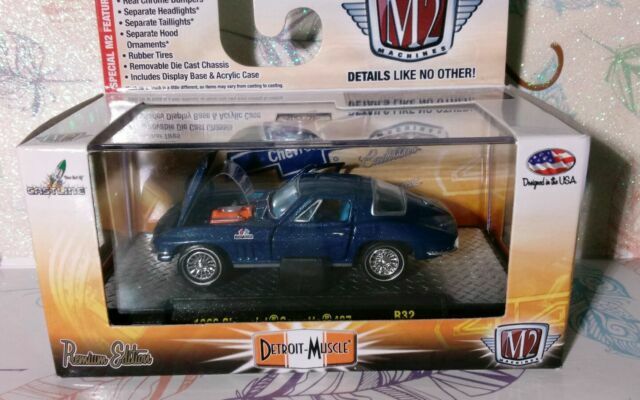 The M2 Machines 1969 Castline Detroit Muscle is a replica of the 1969 Dodge Charger Daytona 440. The replica features a die cast body, and it’s made of real chrome. The car also has a removable die cast chassis. The doors can open and close, and the car has separate headlights and taillights. The hood of the car also contains separate ornaments, and the tires are made of rubber. The car even features a display base and an acrylic case. 1932 Ford Roadster Die Cast. M2 Machines. Why does it say Cobra on it? I've waited years for someone to offer this vehicle in miniature. It is cute and has lots of detail for the size. Nice commemorative, but the lettering detracts. In order to replicate the full scale truck I once owned, it would be necessary to sand it down and repaint it. Quite a difficult task in this scale. This 1968 Mustang is Slick! It has a Metallic Yellow paint job with decals and the number 07. The top and the hood are painted black and the engine has some nice chrome in it. I have a total of more than 50 M2 Machines in this scale and this one sits in the front row. I have all of the M2's lined up inside a Hutch in my living room with glass doors for display. A lot in a little box! Die cast classy model, which is as nice as large expensive models, only smaller for an amazing price! Very detailed. Mint in box! You get much more than you pay for. All the criteria for a content consumer! Great find! All proportions look right on to me. The body painted bumpers and stock wheel covers add to the look. Display case is nice touch, reminds me of the old Matchbox cars that came in boxes. Great style and craftsmanship true to life characteristic and designs. I truly am a fan of M2 machines. I have several in my Collection... Props to Sean Taylor For bringing the world M2 machines! !